John Ruggie introduced the concept of embedded liberalism in a 1982 article that has become one of the most frequently cited sources in the study of international political economy. The concept was intended to convey the manner by which capitalist countries learned to combine the efficiency of markets with the broader values of the community that socially sustainable markets themselves require in order to survive and thrive. Examining the concept and the institutionalized practice of embedded liberalism, this collection provides a survey of the macro patterns in industrialized countries. Leading scholars combine to demonstrate the benefits of embedded liberalism in practice as well as its gradual erosion at national levels, and to analyze public opinion. They provide a better understanding of what embedded liberalism means, why it matters and how to reconstitute it in the context of the global economy. The contributors contextualize the current challenge historically and theoretically so that students, scholars and policy makers alike are reminded of what is at stake and what is required. 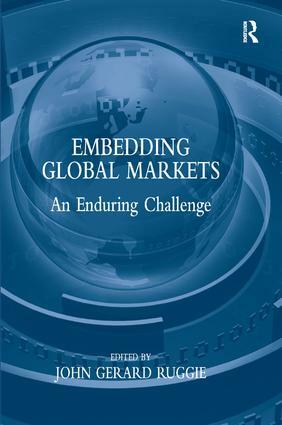 Contents: Introduction: embedding global markets, John Gerard Ruggie. Part I The Idea of Embedded Liberalism: Reconstructing embedded liberalism: John Gerard Ruggie and constructivist approaches to the study of the international trade regime, Andrew T.F. Lang; Hollowing out Keynesian norms: how the search for a technical fix undermined the Bretton Woods regime, Jacqueline Best. Part II Embedded Liberalism in Practice: Trade, globalization, economic performance, and social protection: 19th-century British laissez-faire and post World War II US-embedded liberalism, Salvatore Pitruzzello; Why do open economies have bigger governments? Dani Rodrik; Government spending and public support for trade in the OECD: an empirical test of the embedded liberalism theses, Jude C. Hayes, Sean D. Ehrlich and Clint Peinhardt; Globalization and the decline of the welfare state in less-developed countries, Nita Rudra. Part III A Global Civic Order? : Values and interests in attitudes toward trade and globalization: the continuing compromise of embedded liberalism, Robert Wolfe and Matthew Mendelsohn; Taking embedded liberalism global: the corporate connection, John Gerard Ruggie; Index.